While I've been living in Hanoi, a hotel rennaissance has been occuring in Nha Trang, Vietnam's south central coast beach resort and, also, my hometown. The long and natural bay lends itself to this kind of development, with many of the big players in international hotels moving in to claim their plot of beach front. Tran Phu Street, the boulevard running parallel to the beach, is turning into Vietnam's Gold Coast. I wanted to check out what all the fuss is about. 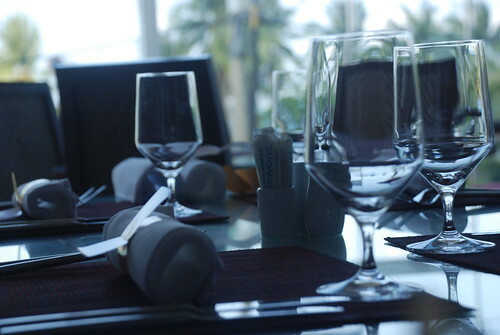 Of course, normally when I'm home I stay with family and when I'm on holiday I stay at family run mini-hotels, so the four-star Hotel Novotel Nha Trang is a big deal for me. A recommendation had come from a friend in the trade and when I was offered a room upgrade as I checked in, I must say that this little experience of luxury was quite nice for a change. 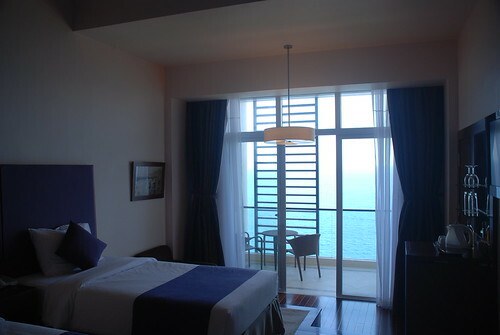 The hotel boasts that every room has a seaview; in some hotels that could mean out of the bathroom window. Not so here. 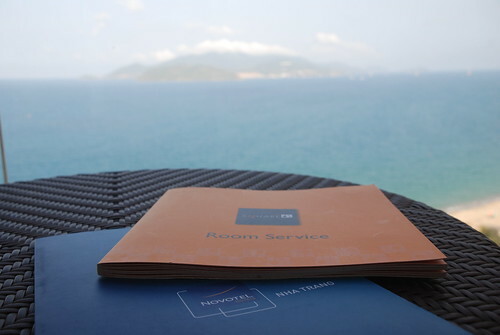 A blue panorama of sea and islands can be seen through full length windows from air-conditioned comfort or from each room's balcony, where Nha Trang's famous afternoon seabreeze takes the edge off the heat of the day. Sunrise in the morning is truly a spectacular sight which one need not get out of bed for. That's a bonus! The room decor is purple on white and there is no hint of Vietnam in the design or the finish. They have avoided the cliched images of girls in ao dai and there is not a lacquer vessel in sight. Maybe there is a Novotel template of room design. The shiny chrome reading lamps are a classy touch by the bedside, which is a couple of steps up on a mezzanine of sorts. This creates a sense of spaciousness, with desk space for laptops, glasses for the main drinking occasions, sofa and the balcony and outdoor setting down below. And don't forget the sea, which really is the star feature of the room! Outside of the room, there is lots to enjoy, including a pool, fitness centre and massage service; all quite typical I guess for regular guests at the Novotel and other high-end hotels. 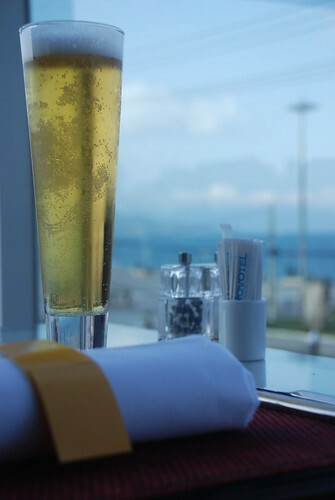 My outside of the room experience was spent mostly with friends and family at the local eateries but I did enjoy a beer at the hotel's main restaurant, The Square, which almost feels as if it is located on the beach. 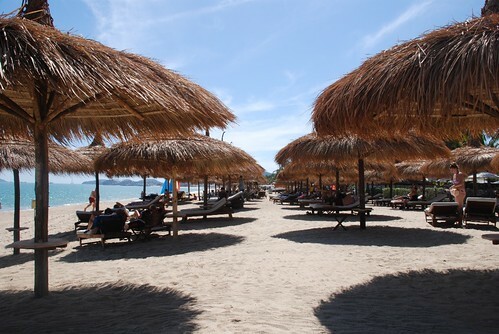 Indeed, the sea seems to be the recurring theme at the Novotel Nha Trang.